In the past week or so, I have eaten what feels like my weight in cauliflower. The vegetable, which I used to eat only in stirfries and perhaps a pickle, has been all the rage. People looking to cut down on eating carbohydrates are using it as a replacement for rice and, indeed, I gave a recipe for cauliflower fried rice in this column in June last year. Others are topping cottage pies with mashed cauliflower instead of potatoes. 1. Preheat oven to 200 deg C. Line one large baking tray (I use the one that comes with the oven) and one medium baking tray with foil. 2. Rinse and pat dry the cauliflower, cut them into smaller pieces. Toss with 1 tsp of the oil and place in one layer on the large baking tray. Rinse and pat dry the zucchini, slice into 0.5cm-thick rounds, coat with 1/2 tsp oil and the salt. Place in one layer on the smaller tray. Put both in the oven. Roast the cauliflower for 25 minutes and the zucchini for 15 minutes. 3. While the vegetables are cooking, slice the parmesan cheese thinly and place in a food processor and let it run until the cheese is ground fine. Scoop out into a bowl and set aside. 4. When done, place the zucchini on a plate and set aside. Let the cauliflower cool for 10 minutes, then place in a food processor and whiz for about 30 seconds. Add the parmesan cheese, eggs and ground almonds and process until you get a thick puree (below). 5. Discard the foil from the large tray and line it with baking paper. Brush the remaining 1 tsp oil on the paper. 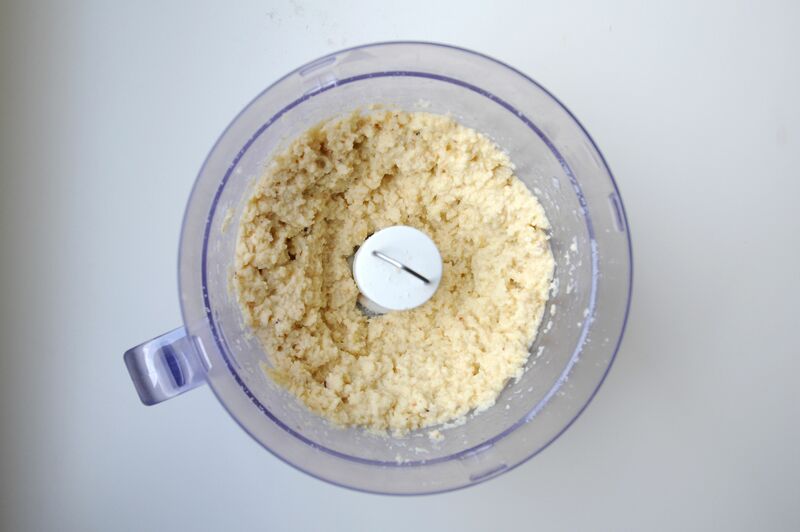 Scoop the cauliflower and cheese mixture onto the paper and, using the back of a spoon, shape it into a circle about 25 to 28cm in diameter. Bake in the upper part of the oven for 18 to 20 minutes or until the crust is lightly browned (below). 6. Remove from the oven and let rest for 10 minutes. Turn oven up to 230 deg C.
7. Slice the mushrooms thickly, no more than four slices for each mushroom and halve the cherry tomatoes. 8. Spread the pesto evenly on the crust. Top with the zucchini, mushrooms and tomatoes. Tear the ball of mozzarella over the toppings. 9. Place in the top part of the oven for eight to 10 minutes or until the cheese is lightly browned. Remove from the oven, let rest five minutes, use the paper to transfer the pizza onto a wooden board or a large plate. Cut and serve. I don't shun any sort of food. I love and eat bread, rice and noodles. But I have to admit that cauliflower fried rice is ridiculously good and does not leave me feeling sluggish after a meal. So I decide to take on another challenge: Replace the bread dough in pizza with cauliflower. Google "cauliflower pizza" and many recipes and videos pop up. Not all of them work though and I try recipe after recipe to find a cauliflower crust that will not disintegrate. The idea is to dry out the cauliflower and mix it with eggs so that it holds together enough to form a fragile crust. Most recipes call for grated cauliflower to be microwaved, then for the liquid to be squeezed out of it. Another method involves dry frying the cauliflower. None of these methods appeal to me - they sound like too much work. I like drying out the cauliflower in the oven for fried rice and use that method for pizza too. This makes sense because the pizza is going into the oven anyway, so it might as well be turned on for a little longer. Just using cauliflower, cheese and egg is iffy, with the crust breaking apart before I top the pizza. The batter for the crust is just too wet, despite the drying out in the oven. The trick, I have discovered, is to add ground almonds to the mixture. It adds a little sturdiness to the crust, a crunchy texture and a nutty flavour. Make no mistake, this is not the kind of pizza that you can pull out and eat with your hands. Yes, it will hold together, but you'd better take a bite from the tip of the slice very quickly before it falls on your lap. The best way to eat it is on a plate with a fork. Like with a regular pizza, the edges are the best, properly browned and very cheesy. In fact, I would happily bake the crust a little longer and eat it as is. But what is pizza without toppings and more cheese? Meat lovers can drape cured meats over it. There is the ever reliable tomato sauce and mozzarella cheese with torn basil leaves. If pineapple, ham and green bell peppers appeal to you, then go ahead and use them. I opt for a green pizza, spreading store-bought pesto on the crust and topping that with lightly roasted zucchini, thickly sliced mushrooms and halved cherry tomatoes for some colour. Use good cheese for the pizza. Get a block of parmesan and grate it in the food processor. You need the machine to make the crust anyway. Supermarkets carry balls of mozzarella from Italy, so there is really no need to use the shredded kind that comes in packets. Now that I have a reliable recipe for the crust, I would like to attempt a four-cheese one with mushrooms and a meaty one with spicy minced beef, sort of an inverted cottage pie. But I might give it a rest for a while. I have had enough cauliflower to last me a few weeks at least. For now, it's back to regular programming and regular pizza.